It may be easy to forget—what with Chicago’s long, cold, gray winter—but summer is still a thing. And it’s coming. Don’t worry, we didn’t forget: We’ve been planning, and we’ve made your ultimate summer bucket list so you can seize every last minute of warm sun. Yes, the focus at this nationally acclaimed farmers market is on the fresh produce and artisan foods (blueberries and tomatoes and cheeses, oh my). But we also come for the rotating musical acts, from bluegrass to singer-songwriters. Sure beats the pianist at Mariano’s. North Side or South Side. Cubs or Sox. It’s all good when you’ve got your best friends, magic hour and all those familiar ballpark sounds and smells. Oh, also when there’s Hot Doug’s at Wrigley and Revolution Brewing beers at Guaranteed Rate Field. Pack up your Yeti and head north (the Metra will take you directly there from Ogilvie) for Ravinia. The outdoor music festival kicks off on June 1, and while the lineup (Alison Krauss, Mary J. Blige) isn’t too shabby, sometimes our favorite sounds are the humming cicadas and crickets among the trees. Summer demands at least one adventure. This three-hour tour will have you paddling through downtown’s canyons of glass and steel, then finishing with a fireworks display at Navy Pier. Sounds pretty majestic, right? 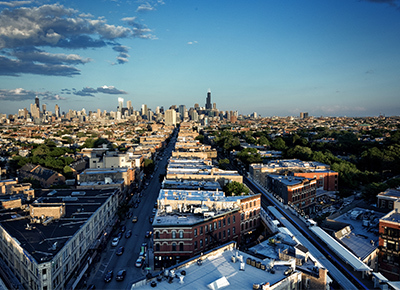 It can be hard to choose a favorite rooftop bar in Chicago: The J. Parker’s looks out onto Lincoln Park and Lake Michigan, but Cabana Club will afford you one amazing skyline view. Welp, with about a hundred days between now and Labor Day, guess you’ll have to hit both. Between its mom-and-pop vibes and 25-plus sweet flavors, this little Italian ice stand always gets us feeling like a kid again. We suggest grabbing a cup of lemon (or mango… or will it be banana chip?) and strolling the 606. A picnic blanket, a sandwich and beer from the Goose Island tent, and a classic flick. It doesn’t get any more summer than that. Oh wait, we forgot about the moment when twilight descends and the buildings on Michigan Avenue get all twinkly. There’s just something about those red-and-white-striped umbrellas. You’ll find us underneath one any Sunday afternoon, negroni slushy in one hand, fried chicken sandwich in the other. It’s OK, squeezing in among the crowds at North Avenue Beach isn’t our idea of fun either. Which is why we suggest these two alternatives: a stand-up paddleboard class with Chicago SUP (you’ll work your core and get an amazing view) or a cabana at Shore Club (think of it as Castaways’ more grown-up sibling). The beauty of Chicago’s street fests is that there’s a little something for everyone. If partying at Do Division (June 1 to 3) or Pride Fest fun (June 16 and 17) isn’t your scene, there’s always the more highbrow Chicago Tribune Printers Row Lit Fest or Old Town Art Fair (both June 9 and 10). The Lyric Opera is about to close out its 2017-2018 season, but it's certainly going out with a bang: Now through Sunday, catch Jesus Christ Superstar (if you were obsessed with the NBC version, just wait until you see it live). You can also stop by for Caribe Clásico (May 19), which celebrates the music of Puerto Rico and Latin America, or the final performance of the season, Empower (May 31), an original opera written and performed by high-school students from the west and south sides of Chicago.